There are over 100 million digital readers in the United States. My novels Peak, I,Q Book One: Independence Hall, and The Captain’s Dog: My Journey with the Lewis and Clark Tribe are all traditional books and eBooks. The Kindle, Nook, iBook, Sony Reader, iPhone, iTouch, iPad and many other devises enable us to carry an almost unlimited number of books in our purses, pockets, and briefcases. Years ago I bought the first version of the Kindle. I bought it because I read 2 or 3 books a week and I had gotten tired of lugging around hardback books in my carry-on luggage. I love the feel, smell, and heft of a real book, but the convenience of the Kindle trumped those feelings pretty quickly. Then along came the iTouch, iPhone, iPad, and several other platforms with a free Kindle & Nook Apps. I’m old, and old fashioned, but I had (and have) no problem reading books on these small screens. In fact, I prefer to read this way now. I have over 250 books archived in my Kindle account, which means I’m carrying over 250 books in my pocket. If I’m stuck at an airport, flying, walking, waiting for a pizza to bake, all I have to do it pull a book out of my pocket and lose myself in the story I’m currently reading. These days, if someone offers to loan me a real book I tell them to keep it and I download it into my iPhone. If an editor wants me to read a book I ask them to send it to me as a PDF or a Word document so I can upload the content to my iPhone or iPad. Because you can share an eBook account with someone it allows you to read the same “book” at the same time. Marie and I were flying back to the farm a few weeks ago. As we were waiting for our flight I went into a bookstore to browse and found a book I had been eagerly awaiting. Rather than buy the hardback, I downloaded it to my iPhone. Because Marie and I share the same Kindle account we were both able to read the book at the same time and discuss it as we read. 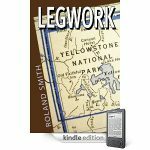 I guess you could say I’m an eBook convert, which brings me to my new novel Legwork, which is only available as an eBook. In 1996 I wrote a novel called Amy’s Missing. My idea at the time was to have it published as a paperback original. I was visiting a lot of schools and all of my books were expensive hardbacks. I wanted to give my readers and their parents a chance to walk away with a book that wouldn’t break the bank. Publishers were interested, but none of them were interested enough to publish the book. I moved on with other novels and Amy’s Missing sat in a drawer until Marie suggested that we publish it ourselves. I was happy to do this as long as Marie did all the work, which she did. She had a few thousand copies printed up. The novel sold okay, but not well enough for us to do another printing. The Oregonian serialized the entire novel in the newspaper with a great deal of success. Then Amy’s Missing quietly disappeared…until now. Marie suggested we convert Amy’s Missing into an eBook. I was happy to do this as long as she did all the work (some things never change). My other condition was I would only put it out again if I still liked the book. I sat down and read it in one sitting and thought: “Wow, this is a great book.” A little arrogant I know, but the story actually stood up to my critical eye and to the test of time. I made a few changes here and there (not many) to update the story, and I decided to change the title to Legwork (when you read it you’ll know why). I should also mention that this new title came from my grandsons JR and Will. I downloaded the book to them. They immediately read it and texted me back: “Call it Legwork, Gramps.” (Thanks JR & Will. Great title). So, if you’ve read Amy’s Missing, you’ve read Legwork. If you haven’t read it you’re in for a treat (that won’t break the bank). I hope you like it. I did. Please help me spread the word. One of the problems with an eBook is letting people know that the book exists. If you know someone who likes my books, or likes to read, or appreciates a good story, pass this newsletter on to them. Let’s test this wide-open frontier and see how it works. I will be running a couple of contests this summer to celebrate Legwork beginning July 1st. The prize for the first contest will be…what else? A brand new Kindle. I’ll even sign it. You can participate by visiting my Webpage or joining my FaceBook Fan Page on July 1st. Other Platforms Coming Soon! Stay tuned. Oh I loved Amy’s Missing! It was at my old school and you signed them! It was really cool! Hey when is your new book Chupacabra coming out, and where can I get it once it comes out? ← June 18, 2011. Bark dust.